Abandoned Baby: This is a rare reverse pattern characterized by a gap followed by a Doji, which is after that followed by another gap in the opposite direction. The shadows on the Doji must completely gap either below or above the shadows of the 1st and 3rd day. Doji: The pattern called ‘Doji’ forms when securities’ both open and close levels are virtually equal. The length of the upper and lower shadows can be various, which results in candlesticks looking like either cross, inverted cross, or plus sign. Doji can be interpreted as a note of indecision or tug-of-war between buyers and sellers during the trading day. Prices can move both above and below the opening levels during certain period and at the end they close either at or close to the opening levels. Dark Cloud Cover: A bearish reverse pattern that supports the uptrend by a long white body. On the next day it opens at a new high and afterwards closes below the midpoint of the first day’s body. Downside Tasuki Gap: A continuation pattern with a long black body followed by another black body, which has gapped below the first one. The 3rd day consist of white body and opens within the body of the previous day, then closes in the gap between the first two days, but does not close the gap. Dragonfly Doji: This pattern is a kind of Doji forming when the open and close prices are at the high of the day. Like on the other Doji days, this one normally appears at market turning points. Engulfing Pattern: A reverse pattern that can be either bearish or bullish, which depends on whether it appears at the end of an uptrend (bearish engulfing pattern) or a downtrend (bullish engulfing pattern). The first day is characterized by a small body, after which follows a day whose body completely engulfs the body of the previous day. Evening Doji Star: A three day bearish reverse pattern that is similar to the Evening Star. The uptrend continues with a large white body. The next day it opens higher, moving in a small price range and then closes at its open (Doji). On the 3rd day it closes below the midpoint of the first day’s body. Evening Star: A bearish reverse pattern that supports an uptrend with a long white body day, followed by a gapped up small body day, then a down close with the close below the first day’s midpoint. Three Falling Methods: This is a bearish continuation pattern. A long black body is followed by three small body days, each fully contained in the range of the high and low of the first day. The 5th day closes at a new low. Gravestone Doji: A Doji line that forms when the Doji is at, or very near the low of the day. Hammer: Hammer candlesticks form when a security moves significantly lower after the open, but closing well above the intraday low. The result is that candlestick looks like a square lollipop with a long stick. If this candlestick forms during a decline, then it is called a Hammer. Hanging Man: This type of candlestick forms when a security moves significantly lower after the open, but it closes well above the intraday low. As the result the candlestick looks like a square lollipop with a long stick. Provided that this candlestick forms during an advance, it is called a Hanging Man. Harami: A two day pattern which has a small body of the second day completely contained within the range of the previous body, and is in the opposite colour. Harami Cross: A 2-day pattern that is similar to the Harami. The difference is that the pattern on the second day is Doji. Inverted Hammer: It is a one day bullish reverse pattern. In a downtrend, the open is lower, after that it trades higher but closes near its open and as a result looking like an inverted lollipop. Long Day: The long day represents a large price move from open to close, where the length of the candlestick body is long. Long-Legged Doji: This candlestick consists of long upper and lower shadows with the Doji in the middle of the day’s trading period, clearly reflecting the indecision of traders. Long Shadows: Candlestick with a long upper shadow and short lower shadow indicates that buyers dominated during the first part of the period, pushing prices higher. Conversely, candlesticks with long lower shadows and short upper shadows indicate that sellers were dominating during the first part of the period, driving prices lower. Marubozu: A candlestick having no shadows extending from the body at either the open, the close or at both of them. The name of this pattern means close-cropped or close-cut in Japanese, even though other interpretations refer to it as Bald or Shaven Head. Morning Doji Star: A three day bullish reverse pattern which is very similar to the Morning Star. The 1st day is in a downtrend with a long black body. On the next day it opens lower with a Doji that has a small trading range. The 3rd day closes above the midpoint of the first day. Morning Star: A three day bullish reverse pattern that consists of three candlesticks: a black candle with long body extending the current downtrend, a short middle candle that gapped down on the open and a white candle with long body that gapped up on the open and then closed above the midpoint of the body of the first day. Piercing Line: A two day bullish reverse pattern. The first day, in a downtrend, consists of a long black-body day. The next day opens at a new low, afterwards closes above the midpoint of the body of the first day. Three Rising Methods: This is a bullish continuation pattern characterized as a long white body that is followed by three small-body days, each fully contained in the range of the high and low of the first day. On the 5th day it closes at a new high. Shooting Star: A single day pattern, which can appear in an uptrend. After open it moves higher, trades much higher and closes near its open. It looks just like the Inverted Hammer except that it is bearish. Short Day: This pattern represents a small price move from open to close, where the candle body length is short. Spinning Top: Candlestick lines that consists of small bodies with upper and lower shadows, which exceed the body length. Spinning tops signal indecision. Stars: It is said that a candlestick that gaps away from the previous candlestick is in star position. 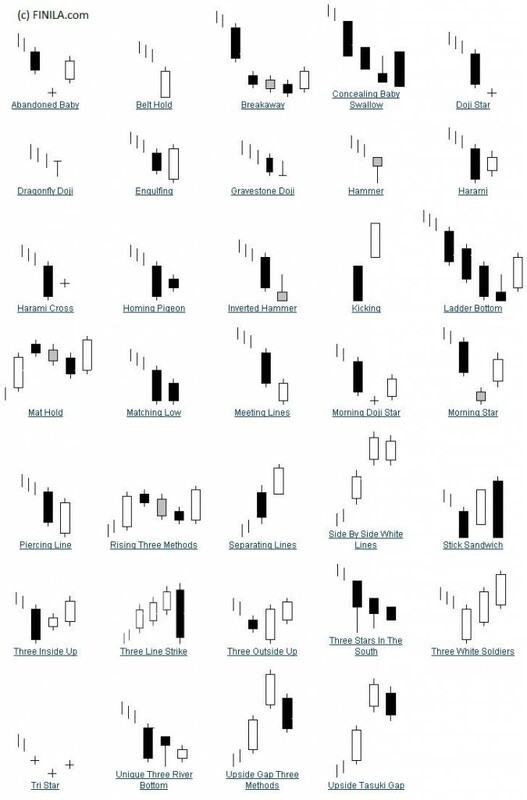 Depending on the previous candlestick, the star position candlestick gaps either up or down and appears isolated from previous price action. Stick Sandwich: A bullish reverse pattern with two black bodies which surround a white body. The closing prices of the two black bodies must be equal. A support price is apparent and the opportunity for prices to reverse is pretty good. Three Black Crows: A bearish reverse pattern that consists of three consecutive long black bodies where each day closes at or near its low and opens within the body of the previous day. Three White Soldiers: A bullish reverse pattern consisting of three consecutive long white bodies. Each ought to open within the range of previous body and the close should be near the high of the day. Upside Gap Two Crows: A three day bearish pattern that only appears in an uptrend. The first day is a long white body that is followed by a gapped open with the small black body remaining gapped above the first day. The third day is also a black-body day whose body is larger than the 2nd day and engulfs it. The close of the last day is still above the first long white-body day. Upside Tasuki Gap: A continuation pattern with a long white body that is followed by another white body which has gapped above the first one. The 3rd day is black and opens within the body range of the second day, then closes in the gap between the first two days, but does not close the gap.